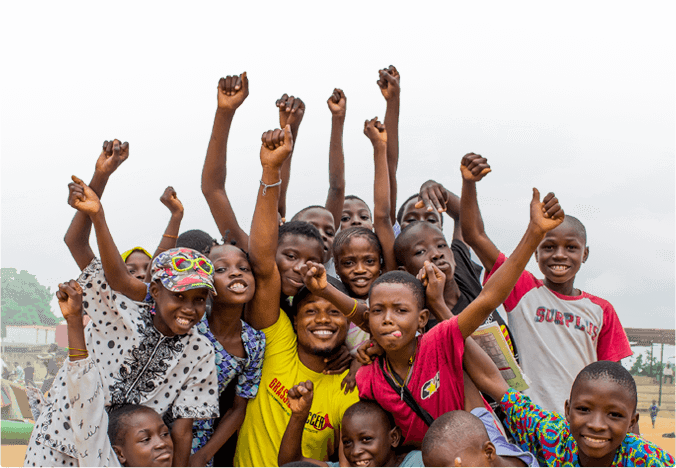 At Grassroot Soccer we are excited to build on the momentum of World AIDS Day as a way to increase awareness and provide access to important health services in the communities where we work. Below is a list of our involvement, by country. In addition, on World AIDS Day we will be launching a partnership with the Love Football You Tube Channel. The national WAD theme for 2012 is ‘Play it Safe’. Using the momentum building for the African Cup of Nations in early 2013 the South African Department of Health and the South African National AIDS Council are encouraging South Africans to ‘Play it Safe’. In Potchefstroom the national World Aids Day commemoration will include a friendly soccer match and HIV messaging. Alongside the pomp and ceremony of the event GRS coaches will be interacting in the crowd and doing demonstration activities with groups of VIPs and players. The national department of education ran a postcard campaign across South Africa. Grade 10’s were asked to give information on the quality of the sexual health programming they receive and to recommend changes. The most thoughtful cards were shared with the head office and a student from Cape Town was selected as the ‘winner’. His ‘prize’ is that his school will host the national World AIDS Day event. GRS will be organizing Fair Play Soccer and GRS HIV interventions on the day for an expected group of 400 children and VIPs, including the US Consular General. Soweto: GRS will co-host an HIV Counseling and Testing event on December 1st in partnership with the Soweto SAFA (South Africa Football Association) LFA (local football association) at the Soweto Nike Football Training Centre. GRS will be providing the Soweto LFA with GRS coaches, help in running the event and testing partners. The Soweto LFA is having an under-17 Soweto Championship on this day, so there will be large numbers of participants and spectators. The Patco bus company will be transporting participants to and from the event. GRS aims to test over 300 people. Orange Farm: GRS will co-host an HIV Counseling and Testing event on December 1st in a new site outside of Soweto called Orange Farm, at the Nike Chris Hani Complex. The testing tournament will be in partnership with the Orange Farm LFA’s under-15 youth tournament, with 12 teams (8 male and 4 female teams). Concurrently with this tournament the Sports and Recreation department will be running a 32-Team U19 Netball Tournament which will be integrated with the HCT, so the netball players will also get an opportunity to go for testing. Along with the HCT (HIV testing and MMC referrals through CHAPS), GRS Coaches will run three lifeskills sessions with participants. GRS aims to test over 150 people. 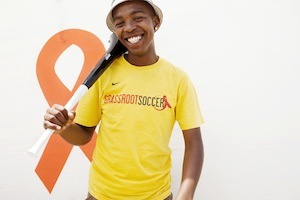 Kimberley: GRS will co-host an HIV Counseling and Testing Tournament on December 1st at the Bloemanda Renoun Grounds. The tournament will be done with 8 under-19 boys teams from the Sol Plaatjie Local Football Association and four girls teams that play in the ABSA League. Counseling and testing will be provided by New Start from Bloemfontein, with the goal to test 300 people. Testing will be provided to all the teams playing in the tournament and anyone from the community who wishes to test. GRS Coaches will be running two activities (My Supporters and Find the Ball) with each of the teams participating. Cape Town: The Cape Town World AIDS Day event on December 1st will take place at the Football for Hope Center’s (FFHC) soccer pitch in Harare, Khayelitsha. Although the FFHC is coordinating this event independently, GRS will be hosting representatives from local partner organizations such as Violence Prevention through Urban Upgrade (VPUU), Aamandla Kulutsha, the Department of Social Services, and the City of Cape Town. 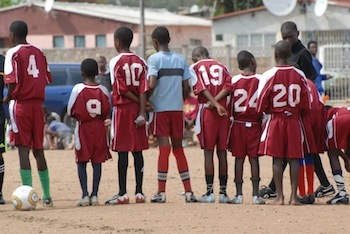 Approximately 24 local soccer teams will compete in the tournament (16 male teams and 6 female teams). With the help of our testing partners, Partners in Sexual Health (PSH), GRS aims to test 250 individuals at the event. Port Elizabeth: GRS will be hosting an HIV Counseling and Testing Tournament on December 1st. The tournament will be taking place at the Isaac Booi school in the Zwide township. Teams will be competing in both soccer and netball with prizes for the winners. GRS aims to test at least 300 people between participants and the surrounding community. 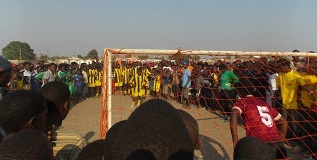 Grassroot Soccer Zambia will be participating in the Provincial World AIDS Day Celebration in Lusaka on December 1st. GRS will be running a tournament with 6 teams from the Police department, GRS, and other organizations. In between the 7v7 games, GRS will be running one of our Skillz activities with all the teams. There will be testing available from our partner clinic and other HIV clinics from around the country, along with music, medical male circumcision services, and VIP speakers. The event is government-hosted, with many NGOs participating.